Hu celebrates his change of country by scouting and shooting beautiful, majestic, and memorable landscapes, setting his drama against truly impressive settings. The military camps out on a plain of stones and some of the rocky passes and boulder-strewn hills rising from the desert recall the iconography of Lone Pine used to so effectively by Budd Boetticher in his great Randolph Scott westerns (an inspiration, or simply a kindred aesthetic invited by his locations?). More than simply lovely, they also suggest a primal power of the world, a place that is both real and fantastical, historical and out of time. This is a world where martial fighting skills border on supernatural ability. Hu uses whip pans and clever editing to make his heroes appear superhumanly fast and even airborne in their leaps (his next film, his masterpiece A Touch of Zen, used hidden trampettes to give his actors and stuntmen an additional boost). This landmark production set a new bar for the popular wuxia pian genre, with its inventive action scenes and dramatic locations, and Ang Lee paid tribute to it (among other films) in the Oscar-winning Crouching Tiger, Hidden Dragon. 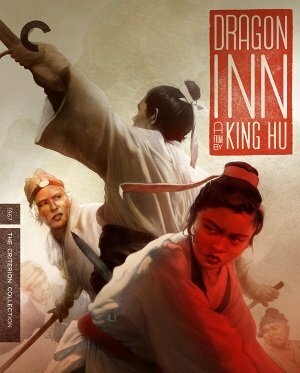 The film makes its U.S. home video debut on DVD and Blu-ray in a Criterion special edition featuring a new digital restoration of the film that showcases the color and magnificent locations of the film. It’s a superb edition and the transfer was overseen by Hua Hui-ying, the film’s director of photography. In Mandarin with English subtitles. Features select scene analysis by Asian film expert Grady Hendrix, new interviews with actors Shangkuan Ling-fung and Shih Chun, and archival footage from the film’s 1967 premiere, plus a fold-out insert with an essay by critic Andrew Chan. 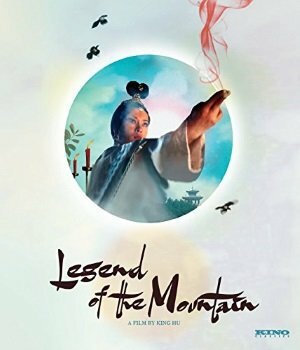 Legend of the Mountain (Taiwan, 1979), Hu’s epic 1979 supernatural tale, echoes his more famous 1971 masterpiece A Touch of Zen and in many ways could be its companion piece. Like the earlier film, it stars Shih Chun as a scholar who arrives at a haunted fort in the mountains, but where the ghosts of Zen were merely a cover for a political exile in hiding, they are truly spirits of the dead here and they are after the Buddhist Sutra that the agnostic scholar has been hired to copy, a Sutra said to hold the power of life and death. There’s a seductive demon named Melody (Hsu Feng) who puts him in a trance with her drumming and tricks him into marriage, a lovely ghost (Sylvia Chang) who runs the local tavern and falls in love with him, a conniving mother-in-law, and an advisor to the General who ruled the fort until his death and remains to protect it, plus a mad servant hanging around the edges and a Buddhist priest shadowing the scholar’s journey. The simple tale plays out over the course of 191 minutes at a gentle, dreamy pace and is filled with sublime shots of the natural world around them, which brings the natural and the supernatural into the same universe. What could be slow and self-indulgent, however, becomes almost entrancing, casting a spell no less effective than Melody’s hypnotic magic. There are some grand scenes of high-flying martial arts battles and magical showdowns but this is less action adventure than epic of sustained mood with long, serene scenes punctuated by humor, mystery, romance, and symbolic images that comment upon the drama. A flop on its initial release and long unavailable, it was restored in 2016 in 4K, returning it to its original running time and visual glory and giving audiences a chance to discover a sublime classic from a legend of Asian cinema. It wasn’t Hu’s final movie but according to Asian film experts and historians, it is his last great work of cinema. Kino Lorber releases the new restoration on Blu-ray and DVD and it looks flawless. It was shot with a dreamy quality and this edition showcases the imagery and color of the border between real and unreal. In Mandarin with English subtitles, with a video essay and an interview with film historian Tony Rayns and a booklet with essay by Grady Hendrix.